What Is An Install Fest? An Installfest is a free workshop held by Linux user groups like ours. 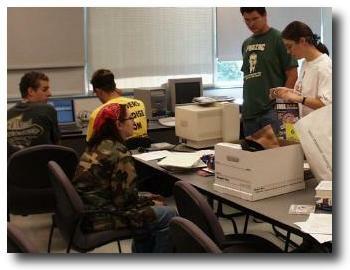 Computer users get together to help each other install and configure the Linux operating system. Simply bring your personal computer to an installfest and people will help you get Linux up and running on it, for free! Note: You must RSVP first; see the checklist below. Finally, use this online form to sign up to get installed! Installfests take place on various days, sometimes Friday evenings, sometimes all‑day Saturday or all‑day Sunday. There's currently no regular schedule. Please arrive on time. We like to stagger when installees arrive, but if you arrive past later than 3 hours prior to the Installfest's end, we cannot help you. Typically, installing Linux from scratch takes about 3 hours. However, be prepared to spend the entire day. We hold Installfests at various locations (sometimes on UC Davis campus, sometimes at a local business, etc.). The announcements will include the address and include a link to directions. If you'd like to help install Linux during an Installfest, or just want to drop in and watch, you can! We have a mailing list dedicated to preparing for Installfests. Details from RSVPs are posted, and volunteers can discuss who's going to help with what system, and try to track down necessary information before the actual event. Who to contact if you'd like to volunteer, and other things you can do to help make these events successful! See also: "Installfest" article at DavisWiki.